Naturally Sweet Sisters: Site Changes #3 and #4 - But Who is Counting Besides Mom? Site Changes #3 and #4 - But Who is Counting Besides Mom? I captured a smile even. 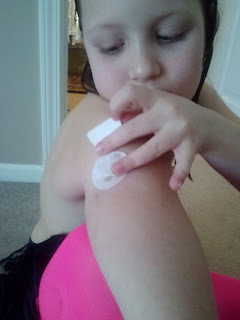 After I posted about our second infusion set insertion, I was thinking that whatever positives that I had tried to create, were sorely lost in the shadow of the girls’ stress. I still can't comprehend having to hand my children a giant needle and tell them to jab it into their skin. What a visual, right?! Not that it is any better for me, it is just that I am mom and therefore, I do many of the unpleasant things around our home (no toilets don't clean themselves!) -- simply because I love my family. Part of me was ready to throw in the towel and continue on with doing site changes just like we had been for so many years leading up till now. (After all, that is what I did when the burden was too great for our Naturally Sweet Husband). Two and half days later though, and the fog lifted from my worries. 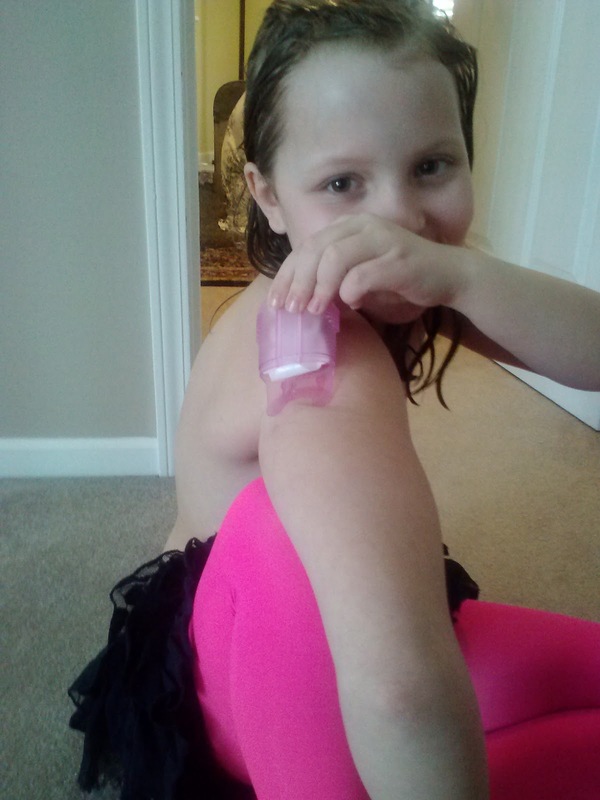 After announcing “Site Change!” to my daughters, I watched as they walked over to our site change area (designated to the second floor landing by the old linen closet – now a diabetes supply closet) and started prepping for the new insertion. Listening to their voices, neither daughter sound particularly stressed or worried about the site change. In fact, they were talking about other non-pertaining ideas of their latest craft project. Surely, hearing their light-hearted conversation was a positive step in having less tears and anxiety over infusion set insertion #3. So I did what any mom would do and quietly (like as quietly as Elmer Fudd hunting rabbits) and in a sing-song voice said, “The quicker we are done, the quicker we can go get ice-cream”. Yes, I know that this could be construed as a bribe… but really, I consider it more of an incentive. The girls both sprang into action with a flurry of wipe, wipe, dry, dry and then (holding my breath) “CLICK!”, “CLICK”. This is the pretzel position where she props her arm on her leg to insert. Trickier even as this time she used her right arm for the poke and the left arm to release. Now I have theories about why #3 went so smoothly. Quite possibly it was the time of day (middle of the afternoon) or maybe it was the fact that both girls had truly been rested AND relaxed. It also could have been that the house was quiet and maybe even a tiny bit of the thought that no other parent was there… because sometimes, even the most well intentioned Naturally Sweet Dad can channel fear vibes. Or maybe it was the bribe, I mean incentive, of ice-cream. In any case, #3 went well and….. But with so many site change opportunities ahead (until we get that CURE), I wonder at what point that I will be able to stop holding my breath and counting. When does a site change become easy? And no stabbed fingers! Yes! !